The location that is now home to Tower 12 and its associated junction was placed in service on October 3, 1897 to connect the South Side Elevated to the Loop Elevated. Tower 12 is located at the southeast corner of the Loop and controls a T-shaped junction, with the short two-block connector along Wabash and Harrison built in 1897 to connect the Loop and the old South Side main line connecting from the south. No records have survived that indicate what numbers 1-7 were to be used for, although they may have been assigned to the Union Consolidated line west of Market Street, for which the company received a franchise but had no real intention of constructing. Another theory is that they were for the various stub terminal stations and junctions, and for the Met's Franklin & Van Buren station. In any case, these administrative numbers survive today only in the names of the two remaining original junction towers: 12 and 18. The tower itself was a two-story affair set inside the junction between the various intersecting and diverging tracks, adjacent on the west of the southbound straight track. Its architecture was more practical than of any particular style, but did feature decorative window frames and sills, belt course moldings, and a hipped roof with a small chimney for the coal-burning stove inside. Entrance to the first floor was through a door at track level. Access to the second floor was also from outside, via a stairway on the exterior of the tower. The interior space was tight. With windows on all sides for maximum visibility, the tower was heated only by a small iron potbelly stove in the corner of the room. The junction was equipped with a hand-operated lever form of switch and signal control. This made the interior a dizzying array of levers and switches, all of which had to be precisely aligned by a vigilant towerman. From 1900 to 1913, the track configuration of the junction remained largely the same. 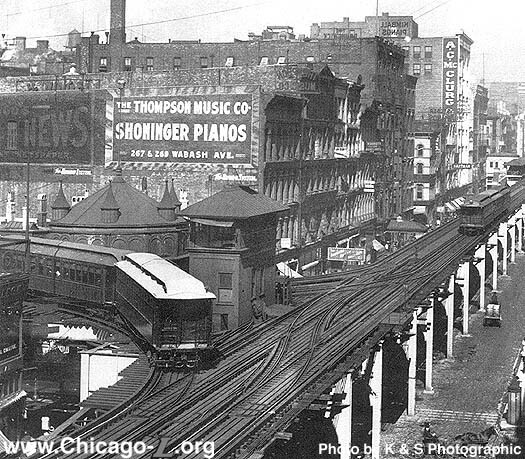 The Loop was operated as a railroad with left-hand running -- a very unusual practice in America -- a trait shared by two other "L" routes: the Northwestern Elevated and Lake Street Elevated. The Metropolitan and South Side elevateds started as and remained right-hand railroads, making the changeover to left-hand operation upon their entrance to the Loop at Towers 8 and 12, respectively. In 1913, the Chicago Elevated Railways instituted crosstown service. With many North-South trains now through-routed, the configuration of Tower 12 would need to be changed. All Lake Street and Metropolitan trains still terminated around the Loop, as well as some night and off-peak Northwestern and South Side trains. Most North-South trains, however, went through and this required an extensive reworking of not only the Tower 12 interlocking but also Loop operating procedures. Just after midnight on November 3, 1913, all trains began operating in a counterclockwise, unidirectional manner, with Northwestern and South Side trains on the outer track and Metropolitan and Oak Park (Lake Street) trains on the inner track. North-South trains operated northbound via Wabash Avenue and Lake Street, while southbound they operated via Fifth Avenue (now Wells Street) and Van Buren Street. At the same time, the Northwestern and Chicago & Oak Park lines changed from left- to right-hand running to reduce switching delays at Tower 18. The configuration of Tower 12 remained the same for the next 56 years, despite another crosstown route revamp in 1931 and the opening of the State Street Subway in 1943. Only small routing changes occurred. 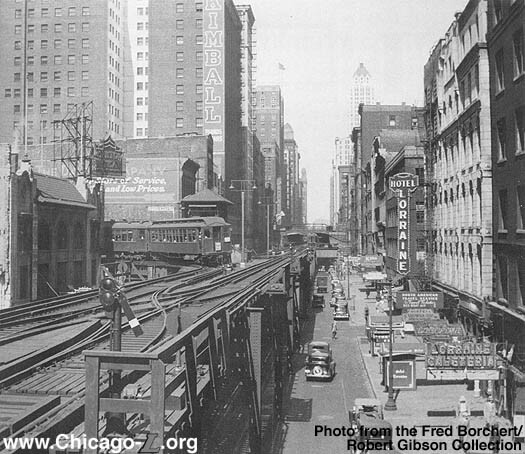 By 1936, the straight southbound track, not needed for revenue service, was removed, with only the eastbound-to-southbound track curving from Van Buren onto Wabash giving access to the southbound South Loop connector tracks. 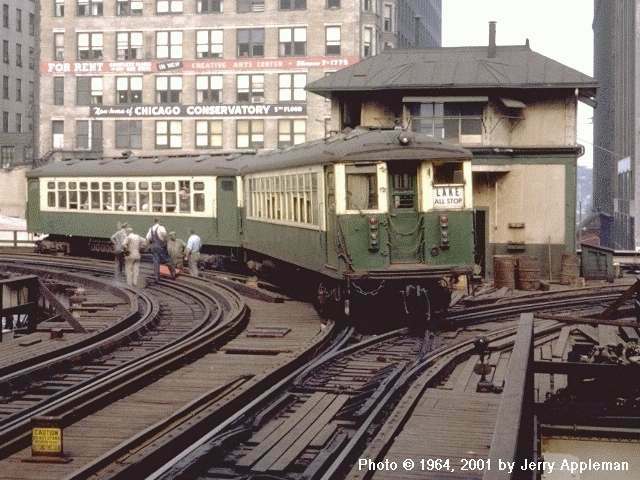 In 1943, Jackson Park-Evanston, Jackson Park-Howard, and Englewood/Normal Park-Ravenswood trains were rerouted into the subway, leaving the Kenwood-Wilson and Wilson-Loop rush hour trains as the only North-South trains running through Tower 12. In 1949, the CTA's North-South service revision brought some of these services back, with all Ravenswood and rush hour Evanston Expresses terminating on the Loop again. In the 1950s, Metropolitan Division trains were slowly siphoned off as well. Logan Square trains were taken off the Inner Loop in 1951 with the opening of the Milwaukee-Dearborn Subway. In 1958, Douglas and Garfield trains were removed from the Loop entirely and placed in a subway as part of the West-Northwest Route. With only Lake and Ravenswood services left on the Loop at all times, supplemented by Evanston Express trains in rush hour, the Loop Elevated reached a low point in terms of intensity of CTA service. 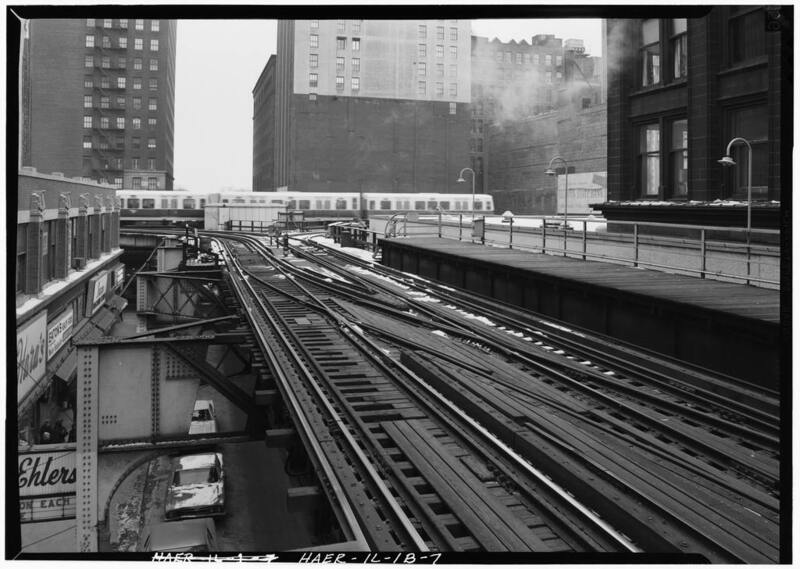 The CTA decided to begin removing some of the unneeded infrastructure in the 1960s. The North Shore Line interurban, which also used the Loop, abandoned service on January 21, 1963. 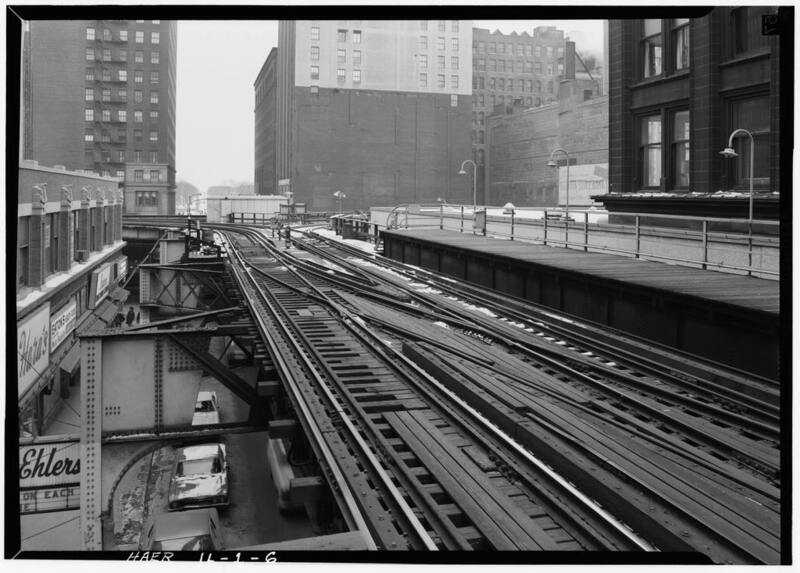 Without North Shore Line trains continuing south from the Loop to Roosevelt Road station via the South Side Elevated, the elevated tracks that continued over Wabash south of the Loop were abandoned except for occasional nonrevenue moves. As a result, Tower 12 was removed from service on November 1, 1963, with the junction replaced with hand-throw switches. The tracks remained in place, however, and as of June 1964 the old interlocking tower still stood. 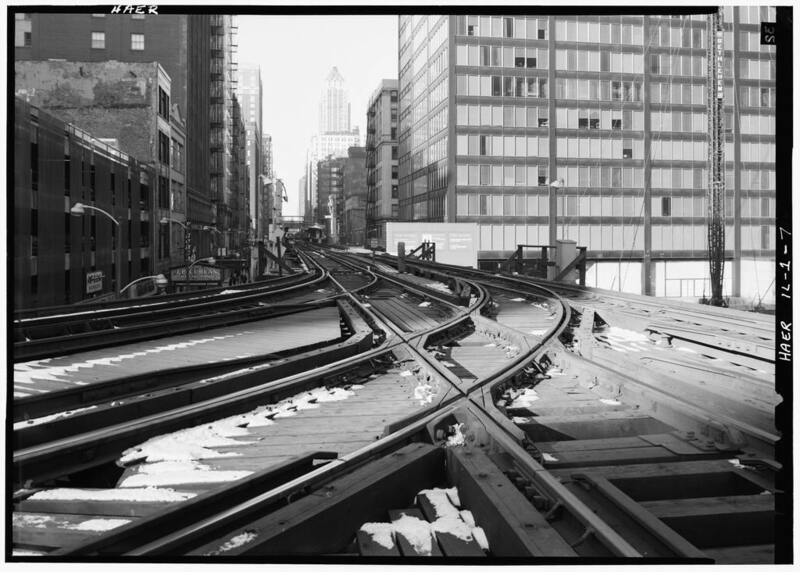 Only about five years later, the Loop experienced a renaissance with the opening if the Dan Ryan Line in 1969. The new Ryan line was through-routed with the Lake route, bringing a surge to the number of trains that would be using the Loop. The Lake-Dan Ryan trains would also only use the Lake and Wabash legs of the Loop, requiring some new track configurations at Towers 18 and 12, reactivation of the South Loop connector from Tower 12 to 17th, and the need to once again differentiate trains at Tower 12. 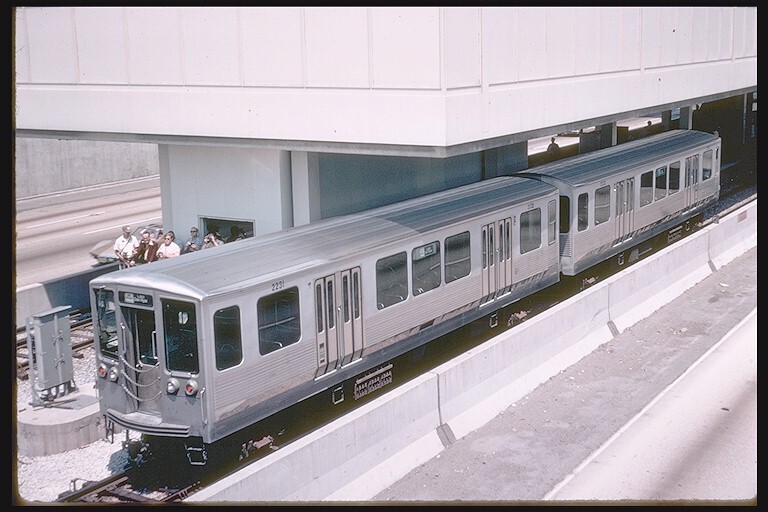 On September 28, 1969, concurrent with the beginning of West-South Route (Lake-Dan Ryan) service, the new Tower 12 interlocking was placed in service. Several aspects of the Loop operations also changed. The Loop returned to a bi-directional railroad, but used right-hand operation this time. Ravenswood trains operated counterclockwise on the Outer Loop at all times and Evanston Express trains operated clockwise on the Inner Loop during weekday rush periods. Lake-Dan Ryan trains took a straight route through the Tower 18 and 12 interlockings. This required a new southbound track straight through Tower 12 interlocking on Wabash to be laid. 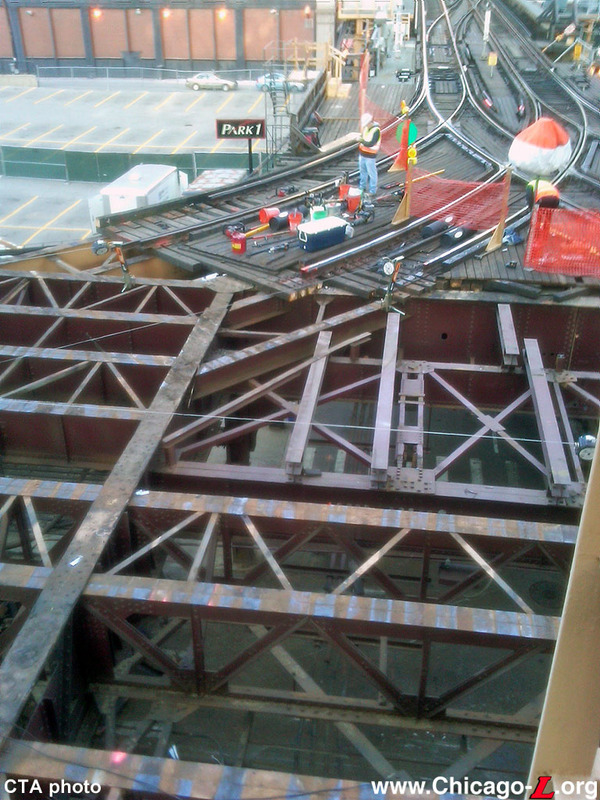 At the same time, the old eastbound-to-southbound curve from Van Buren onto Wabash was removed, terminated in a stub. It is likely that it was amidst these changes that the old two-story wooden tower was demolished, replaced with a simple relay house with a tower panel in the middle of the interlocking, adjacent to the southbound Lake-Dan Ryan track, where the old tower building was. With the addition of Lake-Dan Ryan Line, trains now needed to be differentiated from one another since they took different routes through the interlocking. Ravenswood and northbound Lake-Dan Ryan trains converged at Tower 12, but this could be easily accommodated by automatic operation of the interlocking aligning the switches for whichever arrived first. But Evanston Express and southbound Lake-Dan Ryan trains took diverging lineups at Tower 12 and had to be differentiated from one another. This situation only existed during rush hour, however, as the Evanston Route didn't otherwise come downtown leaving only Lake-Dan Ryan trains going south thorough Tower 12. Rather than staff the tower during rush hours, the CTA decided to fully automate the interlocking. This was accomplished by means of a device carried by the trains that identified to the interlocking equipment what route to set. The device was a flat panel called an "ACI stripe", a vertical reflective stripe with black and white horizontal striping pasted onto the door leaf of the first door of the front of both sides of each Lake-Dan Ryan car. The black and white stripes were, in essence, a bar code that was read by the wayside scanner, which transmitted the identity of the approaching train to the interlocking and set the switches accordingly. If an ACI stripe was detected, the interlocking knew it was a Lake-Dan Ryan train. If no ACI stripe was detected, the interlocking set the switches for the default routing: Ravenswood northbound and Evanston Express southbound. If the stripe was not detected and the lineup was incorrectly set by the interlocking, a manual route selector mounted at cab height next to the track at the junction allowed the motorman to lean out his cab window and manually set the switch. In later years, the ACI stripes were supplanted by the use of transponders, which emit a radio signal identifying the trains. 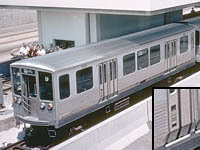 Unlike the ACI stripes, the transponders were put on the Evanston Express trains and the straight-through route now became the default lineup. A transponder reader was located north of Tower 12 and let the interlocking know what type of train was coming. If no transponder was detected, then the switches are set for the default routing, which was for the Lake-Dan Ryan. If a transponder was detected, the route was set for the Evanston Express. Few other changes were made to Tower 12 for many years. 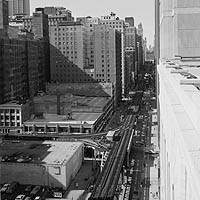 On November 24, 1981, the east-to-south connecting track from Van Buren onto Wabash, which had been removed in 1969 as part of the work to ready the junction for Dan Ryan service, was put back and placed in service. As the years went on the transponder system for the Evanston Express trains fell into disrepair and, with limited funding availability, CTA chose not to repair it. At that point, a towerman was assigned to staff Tower 12 during weekday rush periods when the Evanston Express was running. Otherwise, the interlocking plant could be left on automatic, as there was no need to sort diverging routes when the Evanston Express wasn't running. The next change to Tower 12 came when the Orange Line was being readied for service in the early 1990s. A new switch had to be added to the Tower 12 junction to allow northbound Orange Line trains on Wabash onto the Inner Loop westbound on Van Buren. This new switch was placed in service on April 22, 1993. This presented a new set of alternate routings that would take place at Tower 12 -- northbound Orange Line trains diverging west while northbound Green Line trains continued north -- that would need to be sorted out. It was still desired not to have to staff the tower at all times the Orange Line was operating, so a new set of transponders were installed. 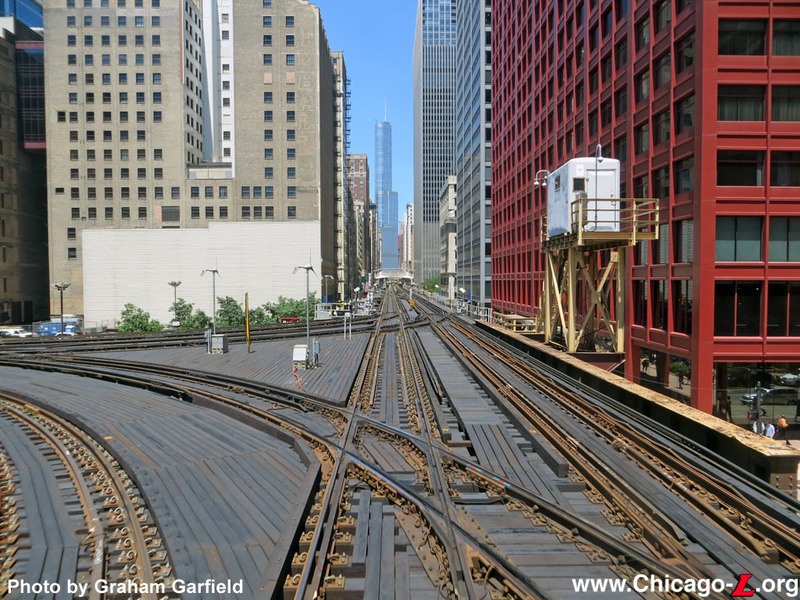 This set controlled the northbound routings from Wabash Avenue. The Orange Line trains carried transponders and a receiver was placed north of Roosevelt station. When the receiver detected a transponder, Tower 12 automatically aligned the switches for the Inner Loop. The default route was for the Green Line, which would be set to continue north on Wabash if no transponder was detected. Southbound Orange and Green line trains took the same lineup through Tower 12, so no sorting was necessary there. Southbound Purple Line (Evanston) Express trains did still need to be sorted out, but their transponder system was left disabled and a towerman continued to be assigned during weekday rush periods. The new Tower 12 interlocking, which also controls the diamond crossover south of Tower 12 at Congress/Wabash, was placed in service on March 14, 1994. 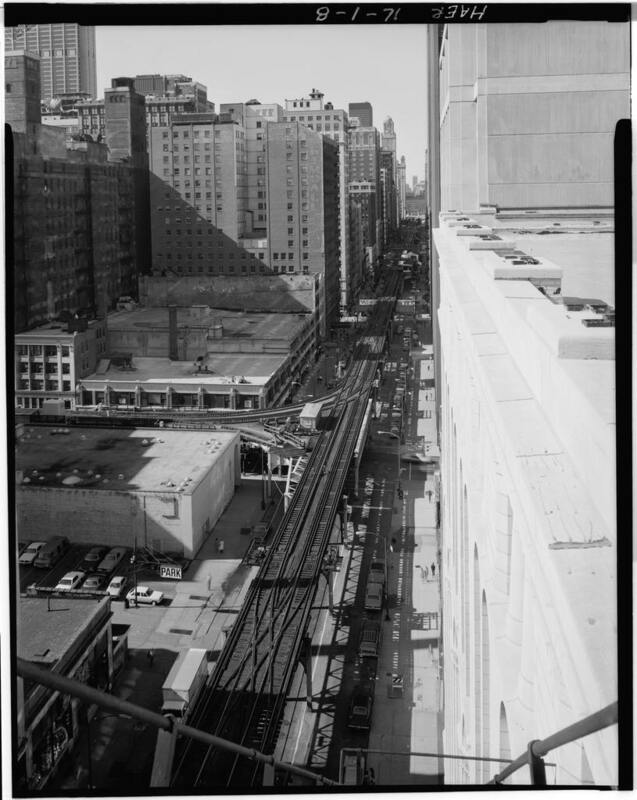 As part of the new interlocking, a new "tower" was constructed on the east edge of the junction, cantilevered over the corner of Wabash and Van Buren. Actually just a small hut on an elevated platform, the higher location gave the towerman a better view of the approaching lines. The old relay house between the switches where the old tower panel had been remained in place as well. Tower 12 saw a surge in traffic when the Pink Line service was inaugurated on Sunday, June 25, 2006. Pink Line trains operated clockwise around the Inner Loop and ran during all but owl hours. This meant that for the first time in decades, an "L" line would be taking the Inner Loop-around route at Tower 12 during all day and evening hours. Because of the increased number of trains trough the junction and the need to have a measure of human decision-making when routing trains, especially during rush periods, the CTA began staffing Tower 12 full-time concurrent with the beginning of Pink Line service. 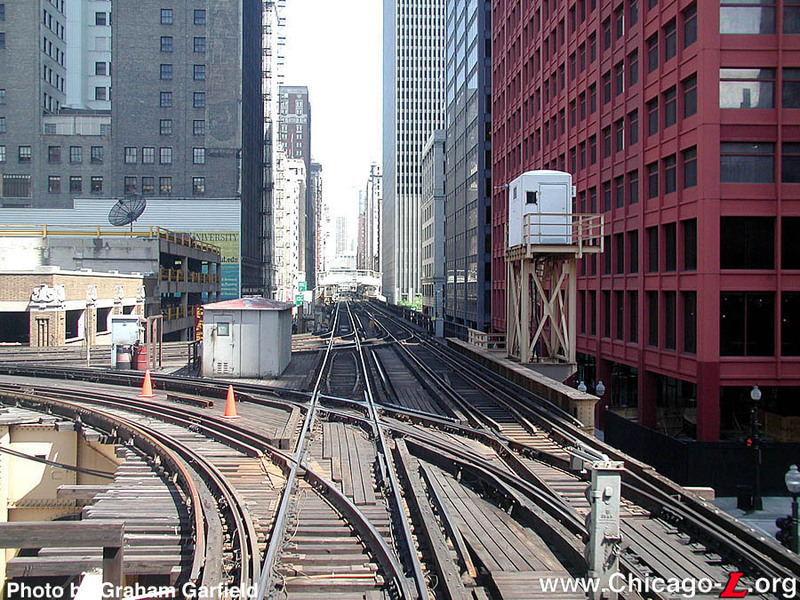 On January 10, 2007, the Chicago Transit Board approved a $48.2 million contract to replace the signal and train control systems along the Loop Elevated tracks. 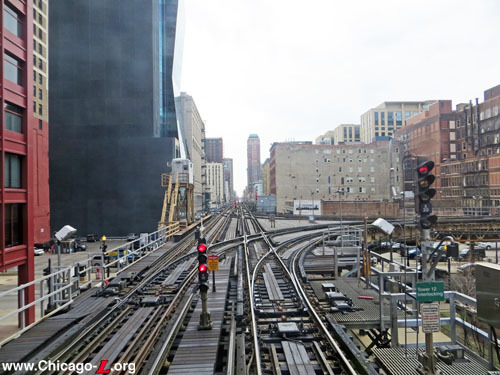 The new train control system replaced a system that was 31 years old and enhanced CTA's ability to operate trains through Tower 12 and Tower 18 junctions. The new systems help to improve the reliability of service by regulating train movement, speed and intervals at those junctions. Divane Brothers Electric Company was selected following a competitive bid process. Funding for the project came from the Federal Transit Administration (FTA), the Regional Transportation Authority (RTA) and CTA bonds. Work was expected to begin early in 2007 and be completed in 2009.1 However, problems with the contractor's performance2 3 4 and the broadening of the project scope to include track renewal on the Lake and Wabash sides of the Loop delayed the project, which was not substantially completed until July 2011.5 In addition, the total contract value increased to $67.9 million, with a total project budget of $103.2 million. 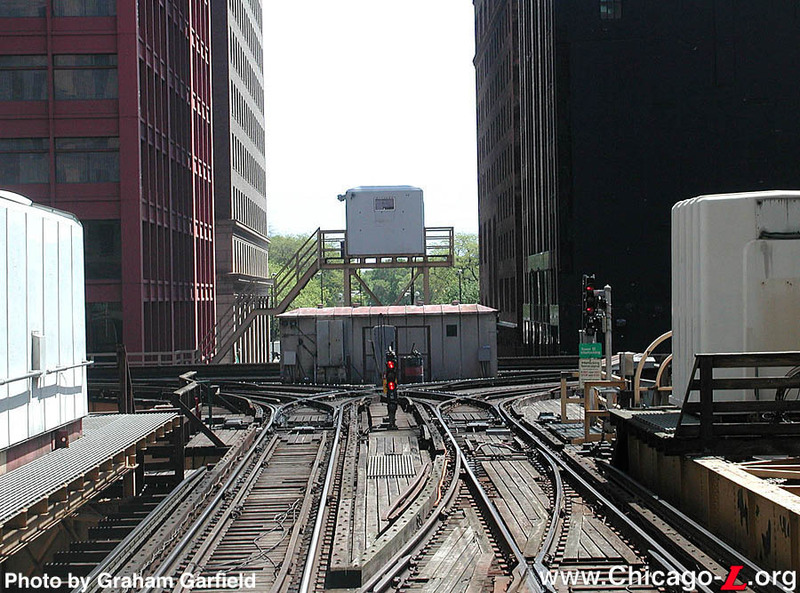 The Loop Signal Project included a new bidirectional cab signal system for the Loop Elevated, a new Tower 18 at Lake and Wells, a new interlocking at Jefferson on the Lake branch, a signal facility building for Tower 18 where the old Randolph/Wells station platforms were, and a new Tower 12 relay house, plus new control panels for Tower 12 and Jefferson Crossover. A portion of the bridge control system that operates the Lake and Wells Street bridges was also upgraded. 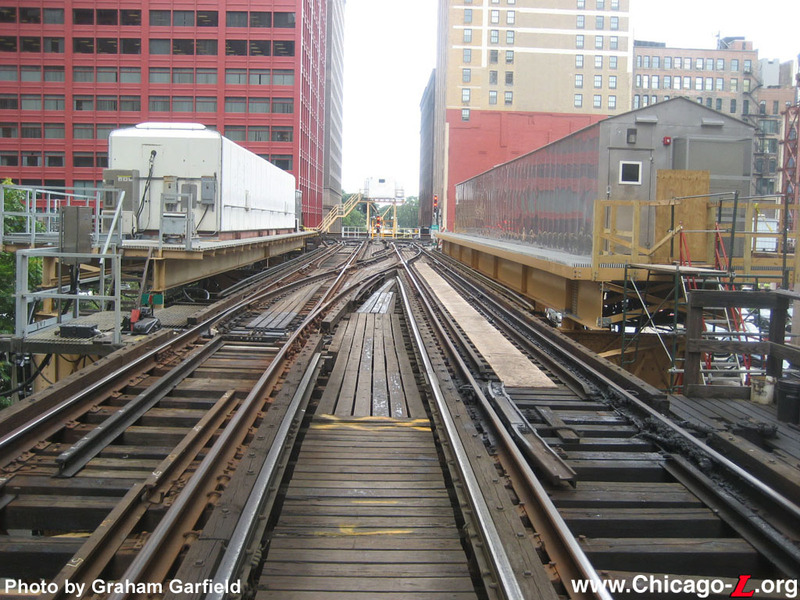 On July 15, 2011, the Chicago Transit Board approved a $33.8 million contract to begin work on the second half of the Loop Track Renewal project, which will involve the replacement of deteriorated track and rail ties along the Wells and Van Buren elevated tracks. Portions of the Loop Elevated system that will undergo renewal work in this next phase of work include the Tower 18 and Tower 12 junctions. The project also will include replacement of other rail system components including foot walks, traction power and signal cabling, signal panels, switch machines, and rail lubricators. Ragnar Benson Construction, LLC was awarded the contract through a competitive bid process. Funding for the Loop Track Renewal project is provided by a state grant through the RTA. Work began in late 2011 and was completed in late 2012. Track renewal on the Loop Elevated required weekend closures of half of the Loop at a time, with all trains rerouted to the other half. 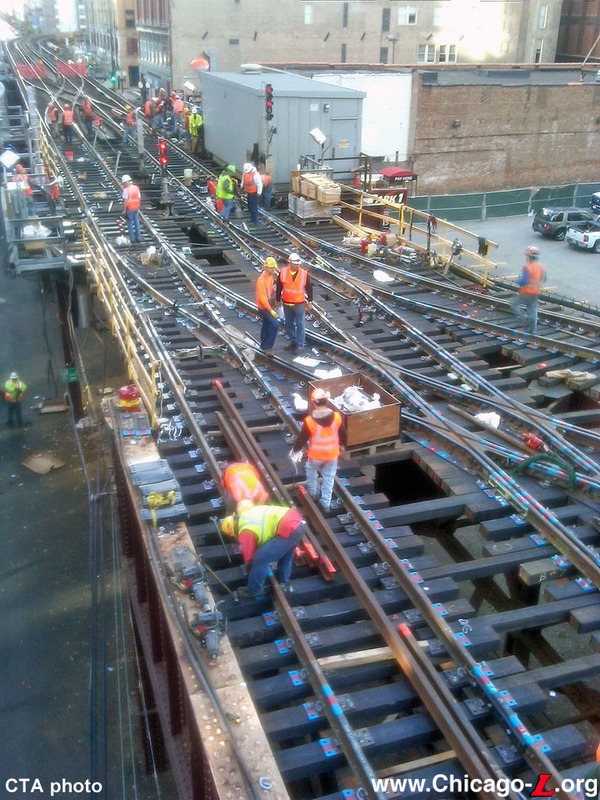 During the closures, new ties, rails, fasteners, and other components were installed, typically by completely stripping and rebuilding a section of track at a time. The first reroute took place the weekend of April 20-23, 2012, with the Wells and Van Buren sides of the Loop closed. Subsequent Wells-Van Buren closures occurred over the weekends of May 11-14, June 1-4, June 15-18, June 29-July 2, July 20-23, Aug 10-13, Aug 24-27, Oct 26-29, Nov 2-5. These closures resulted in Brown and Orange line trains being through-routed via Lake and Wabash and Pink Line trains terminating at Roosevelt operating via Lake and Wabash. Over the weekends of Sep 7-10, Sep 21-24, Oct 12-15, the Lake and Wabash legs of Loop 'L' were closed. Brown and Orange lines through-routed via Wells and Van Buren sides of Loop, Green Line service operated via Wells and Van Buren sides of Loop, and Pink Line service operates between 54th/Cermak and Roosevelt via Wells and Van Buren sides of Loop. 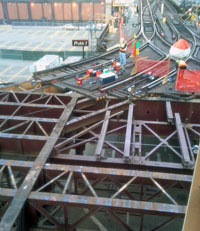 In order to replace the trackwork and components at Tower 12, for one weekend a large portion of the junction had to be closed. That work occurred over the weekend of Sep 28-Oct 1, during which no 'L' service was provided between Tower 12 and Roosevelt station. Orange Line service operated between Midway and Roosevelt only, Green Line service operated in two sections: between Harlem/Lake and the Loop, via Outer Loop, and between Roosevelt and the 63rd Street terminals. A bus shuttle was provided between Roosevelt and the Loop. 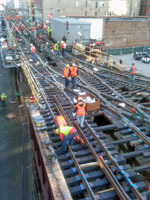 During that weekend, all of the tracks, ties and other components were stripped and replaced in the eastern and southwestern portions of the junction. Track renewal wrapped up for 2012 with the November 2-5 reroute, during which the Outer Loop track was replaced at the Wells/Van Buren curve and additional work at Tower 12 was completed. Work at Tower 12 and the rest of the Loop was largely complete by the end of 2012, but work at Tower 18 and on the Brown Line north of Merchandise Mart at Hubbard Curve that was part of the original scope was postponed to be undertaken concurrently with CDOT work in the same area in spring 2013. An interesting component included in the new infrastructure installed during the track renewal were a series of windmill-type devices, propellers on poles not unlike an anemometer (a device for measuring wind speed), throughout the interlocking. These devices are intended to use the wind to generate small amounts of power that are stored in battery backups for the rail lubricators on the curves. Normally powered by the same AC electricity that powers the signals and other components, the rail lubricators typically have solar panels to provide backup power, but these do nor work well in the Loop because of the tall buildings blocking the sun. "Construction Project Briefing." Report to the Chicago Transit Board. 2011 July 15, pg. 7. "Problems in Loop could further delay CTA project." Chicago Tribune. 2008 September 11. "Loop L signal work delayed." Chicago Sun-Times. 2008 September 11. "CTA work may be delayed by year." WLS-TV Chicago online. 2008 September 11.